Those of a certain age who were around on February 3 1960 will smile at the memory as we await Newport County�s thoroughly deserved fourth round FA Cup replay at Wembley. Just in case you are not a Spurs historian, let me remind you that was the day Tottenham crushed Crewe Alexandra 13-2 after a 2-2 draw at Gresty Road, the cramped home ground of the Railwaymen. They came to the end of the line at White Hart Lane in front of a 64,000 crowd and against a Tottenham team featuring nine of the players who would lift the League championship and FA Cup the following season. For the record, Tottenham�s goalscorers in their club record victory were Les Allen (5), Bobby Smith (4), Cliff Jones (3, 1 pen) and Tommy Harmer. Please don�t interpret this as me expecting a similar nuking of Newport next week, but I will be astonished if Spurs do not have the ammunition to lower the colours of the gallant Amber Army at the second time of asking. It should be onwards and upwards into the fifth round, and Harry Kane can keep alive his ambition to score in every round of the Cup, including the final � a feat that has not been achieved since Peter Osgood�s glorious haul for Chelsea back in 1970. What we learned on Saturday is that Our Harry and Fernando Llorente do not dovetail together like a partnership made in heaven. Kane was much more comfortable once the Spaniard had been replaced by a hungry Dele Alli. Harry and Llorente too often found themselves going for the same patch of grass, and it was only when he was reunited with Son and Dele that we saw glimpses of Kane at his most potent..
Man United including Sanchez at Wembley on Wednesday, Liverpool (at Anfield, February 4), Arsenal (home, February 10) and then the fairly important date with Juventus in Turin on February 13. 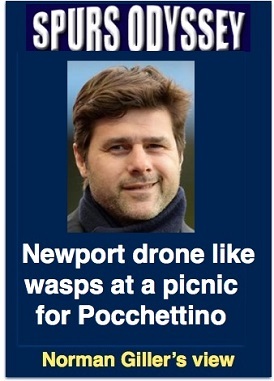 Newport will be like wasps at the picnic in the middle of all this. The drone that appeared worryingly above the Rodney Parade ground added to the Tottenham jitters. What a weird world in which we now live! Our guru Paul H. Smith gives Newport full credit for Saturday�s performance HERE. For me, it was a match that reignited the magic of the FA Cup, and you have to be something of a Spurs miser if you cannot acknowledge that the Welsh dragons warranted their money-making replay at Wembley. Once again, we discovered just how important the still-under-the-weather Christian Eriksen is to Tottenham. He is the man who makes the team tick. Without his precise passes Spurs are like a ship without a rudder. Pochettino will want to put his name on the team-sheet for Wednesday�s crucial appointment with Manchester United. One prediction from me: We supporters will be nervous wrecks in need of a wipe down with the Sporting Life by the time the next two weeks are over. It�s never easy being Spurs watchers. WEEK 24 of the Sports Odyssey Quiz League 2017-18. The rules are simple: I ask one Tottenham-related question for which a right answer earns you two points, and then a related teaser that can bring you an extra point. Who joined Tottenham from Blackburn Rovers in 2008, and won seven England caps? Against which of his former clubs did he score his first League goal for Spurs in a 4-4 draw? Please email your answers by Friday�s midnight deadline to: soql24@normangillerbooks.com. Question 23 was: Who captained his country 42 times while winning 59 caps and joined Spurs from Coventry City? With which club was he a League championship winner? I tripped up very few of you with that one. The answer, of course, the very competitive Terry Yorath (who you could imagine kicking his granny to win a game of Tiddlywinks) and Leeds United, where he learned to tackle first and ask questions later. Recurring injuries prevented him showing his best form with Tottenham. We used to say, �Alas, poor Yorath.� The sort of man you would want alongside you in the trenches. His daughter, Gabby, continues to sparkle through an excellent broadcasting career. First name drawn from the correct answers: Jack Cooper, of Wealdstone, who has been a Spurs fan since the early 1970s. I will send Jack a screen version of my Spurs �67 book (I have now sold all copies, and the book raised �4,000 for the Tottenham Tribute Trust to help our old heroes Thank you all those Spurs Odyssey followers who gave their support).